Along with the traditional pandoro and panettone cakes, Torrone is another Christmas staple enjoyed by all Italians. 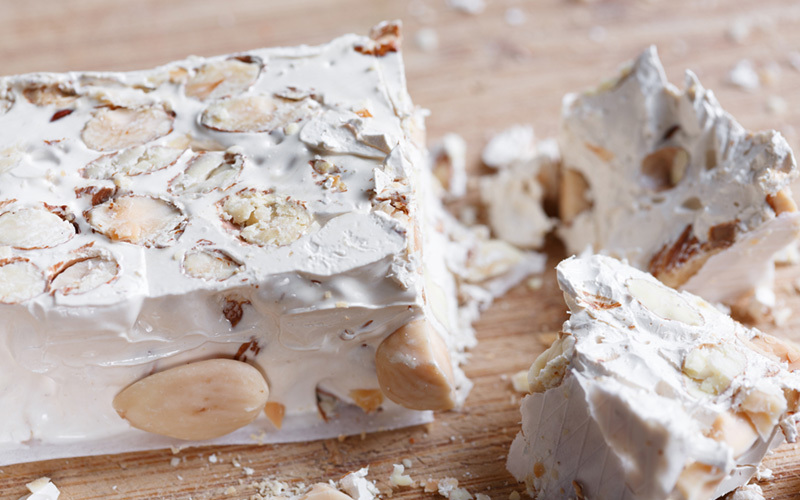 A nougat made of honey, sugar and egg whites with toasted almonds, torrone is the most popular Italian candy. Torrone is loved throughout Italy and almost every Italian town has its own recipe or favorite way to make this sweet treat. Torrone is thought to have been an ancient, pre-medieval recipe. Some people believe it derives from an Ancient Roman treat, while others argue it comes from an Arabic dessert. However, the most popular origin story dates torrone back to 1441 in Cremona as a dessert created for the marriage of Francesco Sforza and Bianca Maria Visconti, the Duke and Duchess of Milan. It was modeled after the city’s tower, Torrazzo, from which it is thought to be named after. Torrone was then considered a valuable treat and was gifted at Christmas by influential people. 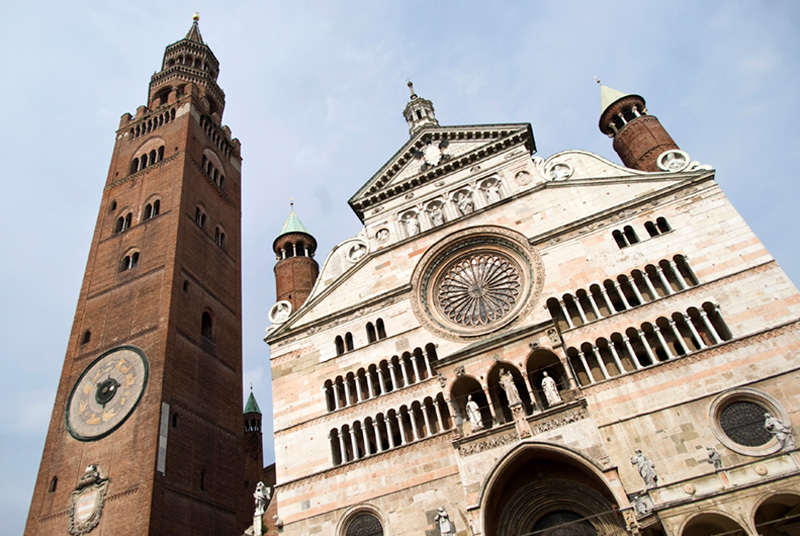 Each year, the people of Cremona celebrate the delicious nougat candy through La Festa del Torrone, an eight-day celebration that includes a reenactment of the legendary marriage. Torrone became the inspiration behind many other beloved commercial candies. Torrone is made all over Italy, and every region has its own spin and flavoring for torrone, using different nuts or flavors to make it their own. There are two main types of torrone that then come in different varieties: traditional (hard) torrone and soft torrone. The difference in making hard and soft torrone is in the cooking time and the amount of egg whites used hard torrone is cooked up to ten hours whereas soft torrone is cooked for no more than three hours. Because of the shorter cooking time, the soft torrone ends up with a higher concentration of water which, combined with a larger percentage of glucose, results in a softer dough. Torrone, both hard and soft, can come in individually wrapped pieces or as larger nougat bars. Flavor varieties include vanilla, lemon, orange, pistachio, chocolate, chocolate covered, hazelnut, giandui, and any combination of these. Torrone used to only be available from October to January because it is best made in cool, dry temperatures. Making torrone on a warm, humid day results in a sticky torrone that will not set properly. Although it was previously only associated with Christmas, torrone can be found throughout the year and enjoyed at any time. 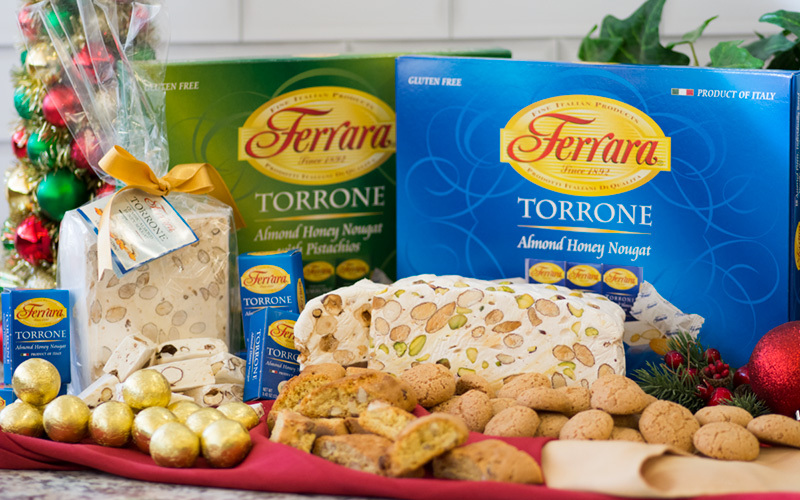 Click to explore each brand and learn more about our lines of Ferrara, La Florentine, and Bellino torrone. Ferrara preserves the rich history and tradition of torrone by making it from only the finest ingredients, which produces a delicious confection free of artificial colorings and preservatives. 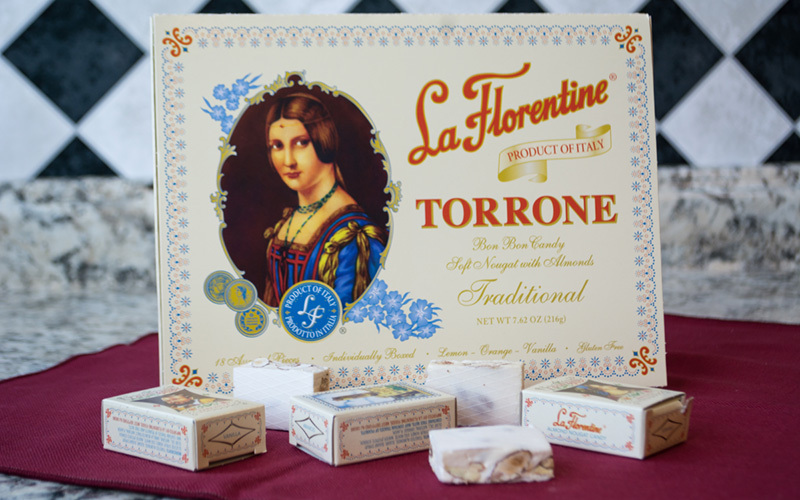 La Florentine’s combination of retro packaging and classic flavors evoke a sense of nostalgia for old-world Italy and traditional confections of past generations. Bellino Premium Italian line of specialty torrone is produced using only premium ingredients and a recipe that has been passed down throughout the years, producing a classic Italian treat.